Kitchen sink comes with a variety of shape, materials, colors, design, size, and position. In this article, we will provide you with some of the best ideas on how a corner kitchen sink should be. The stainless corner kitchen has a phenomenal design which is dazzling because of its reflective surface. Equip with a place to let the water drip from your dish after cleaning on the side is a nice addition to this kind of design. Combined with a brown wood colored table tops, this sink looks stunning and adorable to any kitchen theme you choose. Matched with any kitchen themes. It can be easily dented when knocked hard by your dish. Make sure to clean any leftover detergent because if not cleaned properly, it will leave some stained. 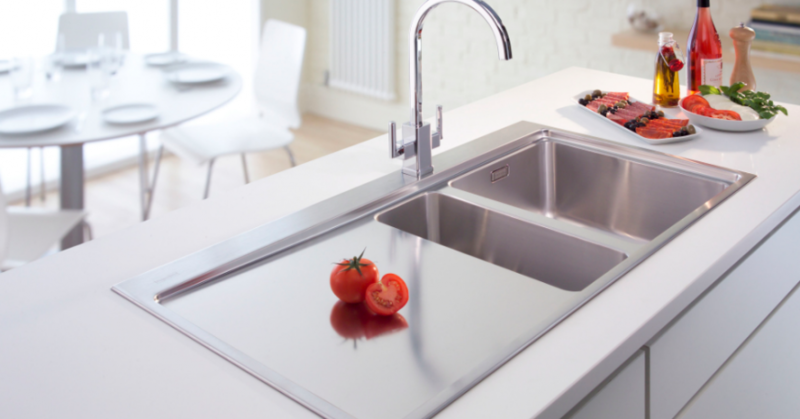 The steel sink has a deep shape so it can be filled with a lot of water and dishes. This kind of sink has a mix of the modern and simple layout with a practical use. It has draining pipes board on the side of the sink with a smooth external surface area so it looks good. The countertops are combined with two windows behind the sink to let the sunlight enter easily. The sink is wide and it come in handy to washes either groceries or dishes in it. With a deep surface, you can reduce water splashes the countertops. The deep surface may give a problem when your children wanted to clean their own dishes, because if your children are not tall enough they will not be able to reach the base of the sink. This sink is made of steel which has a high durability to rust but still, you must pay attention to keep it dry after using it, so it will not easily get rust. Kitchen sink that made of granite has an elegant look. The granite itself is a good material because it almost stain-free. The sink has 2 faucets, one is huge and the other ones small. You can use the faucet accordingly to your need when washing your dishes. The wide space behind the sink can be used to place some ornaments such as flower to brighten the mood of the kitchen. The granite are rather expensive when compared to a stainless-steel. You need a special detergent to clean and maintain the sink’s surface so it will stay clean and shine beautifully. Corner kitchen sink using porcelain will have a high durability and clean looks. White sink color can be combined with any kind of kitchen table color such as beige, brown, or maroon. Behind the sink, you can place utensils hanger to keep your cooking tools organized. Above the utensils hanger, add a small wall table to place the dish that has been cleaned. Clean looks and fits in any kitchen theme. The sink that made of porcelain has a high durability. Utensil hanger behind the sink helps to neatly organize your kitchen utensils. Some water splash can make the hanging utensils get wet. Short faucet makes it a little hard when washing a large dish or kitchen utensils. Black marble kitchen tabletop combined with two basin corner sinks and large windows gives an amazing relaxing feel when doing chorus. Either you’re washing the dishes or cleaning some veggies, you can do it while enjoying the scenery. A small space behind the faucet can be used to put some herbs or flower in a small vase to give a more natural touch. Two wood colored cabinets on each side of the sink can be used to place the dish after washed cleanly. You can enjoy beautiful scenery from the sink thanks to the large windows behind the sink. The black marble tabletops give an elegant feeling to the corner kitchen sink. Two large and small faucets to be used accordingly to our needs. Water splash on marbles may cause some stain if it not dried well. Lamps needed to be placed above the sink in the night, because black marble tabletops can be a troublesome. A white kitchen sink combined with brown colored marble tabletops gives a nice elegant feel to the kitchen sink. Three wide cabinets above the sink can be used to keep the dishes after being washed. Few drawers are placed under the sink to keep cooking utensils such as fork, knife, and spoon. Small lamps installed above the cabinet to brighten the view of the sink surely give a nice touch. This idea can be executed on a small space. The tall faucet makes it easy to wash large dish and utensils. Bright lamps make the sink easy to use even in the night. With the cabinet above the sink, you must be careful when washing the dishes. Because you can accidentally knock your head on the cabinet. With no natural lighting, this kitchen sink only depends on the lamps under the top cabinet to light the sink. This simple kitchen corner sink with a black color tabletops surface are installed with few big cabinets under the sink. Few paintings placed above and beside the sink to give a nice homey looks to the sink. Some cup holder also installed above the sink to keep the cup safe and clean after it being washed. There is also a small table wall above the sink to keep other cups. The simple and homey design gives a comforting feeling. The cup holder placed above the sink makes it easy and practical to keep the cups after done washing them. A napkin placed nicely on the left side of the sink to wipe off water splash from the sink. The corner position with no window can make the sink become humid easily if not cleaned regularly. The space used is rather small so it is hard to wash a large and a lot of dishes simultaneously. As you can see, there is a brown themed marble combined with a huge brown cabinet and two large windows behind the sign. The small faucet choice and two small basins for the sink with a square shape to wash the dishes gives a simple theme to the whole kitchen. Few drawers also installed under the sink to save kitchen utensils easily. Nice use of brown color that gives a warm feeling. Large windows behind the sink to let the natural lights enter the kitchen. The basin is rather small. So, it’s a little hard when washing a large dish and utensils. You must cautious to water that might splashed to the tabletops. Therefore, it will be best to keep the tabletops dry after using the kitchen sink. Because the space of the kitchen corner sink is way too narrow, it can only use by one person at a time. So, it is hard when we want to wash the dishes together with family member or spouse. There are lots of things to be considered when making a corner kitchen sink. The materials to use, what colors we choose, how many faucets to install, does it need to be near the dishwasher or the stove, the availability of natural sunlight from the window or artificial light from electric lamps. We also need to calculate how much space we will go to use. Those things tend to make people having a hard time to decide their kitchen layout. Let alone the problem in choosing the right size of the kitchen stove, what kind and how many cabinets needed, how much space needed to make the whole kitchen and many other things. Because everyone know that one crucial part about the kitchen is their sink. The sink is the place where people wash and clean their dishes after use. It is also the spot to clean all groceries such as fruit, veggies, etc. Therefore, creating an efficient and effective corner kitchen sink is a complex thing that needs a balance between its function and looks. By reviewing our ideas about corner kitchen sink, we hope that you can choose the best sink to built in your kitchen that suited to your needs.